Baby is about 16 ½ inches/42 cm long and weighs between 4 ½ to 5 pounds/2 to 2.3 kg (although I have a feeling this guy may be a fair bit heavier than that given his size last week) he is the size of a melon! Look at this big round belly! Rib pain! I’ve been having some major pain on the right side of my rib. I googled it and they say that because everything is so much more flexible when you’re pregnant that your robs can start to bow out as your belly grows bigger. Counter pressure has been helping but it’s definitely uncomfortable! 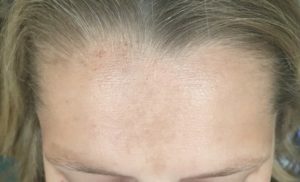 I also have Pregnancy Melasma (AKA The Mask of Pregnancy) all over my forehead and above my eyebrows! (Pregnancy related dark skin patches) I’ve actually had this for a few weeks now but it got much more noticeable this week. My Mum apparently had it too when she was pregnant with me, it’s a new symptom though and I at first thought it was bad sun damage that I’ve never seen before now I realize that it’s melasma, something I didn’t have with Bodhi’s pregnancy. It’s been an exahausting 5 days or so since my travel back from Australia and straight in to 4 days of press, screenings and a premiere for Hacksaw Ridge. A lot of long days, early mornings, high heels and engaging for hours trying to come up with new and exciting ways to talk about the film. The anemia and lack of sleep has been taking its toll so I’ve been drinking Green Tea to stay alert and on point since this movie is so important to me. I just landed in New Orleans today so more travel, but the end is near and the positive reception towards the film has made it all worth while! I found out I was nominated for Best Lead Actress at the AACTA’S in Australia for Hacksaw Ridge! I’m still in shock, I cannot believe it. For those who don’t know the AACTA’S is the Australian equivalent of the Oscars. So it’s a complete surprise and honor and it’s taken a while for the news to sink in. The only downside? The awards are the same day as my due date! hahaha Ahhh life! One workout video with Jeff again this week! Lots of long working days and travel just makes me want to catch up on sleep so that’s exactly what I’ve been trying to do! Vegan Gluten Free muffins, Green Juice, Mixed Berries, Acai Bowl, Bircher Muesli. Square bar, cheese and crackers, string cheese, cacao hot beverage, guacamole and chips. Salmon salad, Mixed Green Salads, Spinach Artichoke dip and Sourdough bread. Vegetarian quesadilla, guacamole and chips, veggie pizza, Kale and avocado salads. Bodhi picked a Halloween outfit out for the baby! It was adult sized so it was really sweet that he thought it would not only fit but maybe baby could come out of the belly to try it on. Bodhi kept saying that the baby could ride in his Monster Truck that I am building Bodhi for Halloween he said “I’ll drive you baby! You can come with me to Halloween and eat the lollipops” Bodhi and I are making his “costume” from a red wagon and some cardboard and my level of commitment (obsession?) has made it a rather tedious process! SLEEEEEEEP!!! I’m seriously craving sleep, lie downs, foot rubs and chillax time; none of which I’m having! But the work week is almost done and soon I’ll be in Australia with the family getting to nest and await this little ones arrival! In the meantime fun times with friends this week at Halloween Haunted Hayride makes up for pregnancy fatigue! I’ve been thinking all about the birth this week. I found an amazing website called naturalbirthandbabycare.com which also has a podcast called Birth Baby and Life podcast. It’s so special and right up my alley. I LOVED reading the birth stories and reading about labor pain management, preparing the body for birth and the article on What Contractions Feel Like. What a beautiful reminder and a loving community. This week Jeff @la_mindset takes me through a super fun workout with Bodhi as my cheerleader once again! I’m definitely feeling the end is near now! Remember whilst you work out to keep listening to your body, take it easy and check in with a doc before starting a new exercise regiment. Happy Fitness!